I was in college the first time I saw a man in a kilt. It was winter in Wyoming, so it was very cold - about 15 degrees below zero - and there was a constant, lazy wind blowing. There's always wind in God's country, but in the winter it's too lazy to go around you and your hopelessly optimistic bulky clothes...it just goes straight through you and freezes your bones. And that's when you're fully dressed with underclothes, thermal underwear, wool socks, jeans, sweats, t-shirt, sweater, sweatshirt, down vest, windbreaker, heavy winter coat with hood, Thinsulate cap, ski cap (with stylish, bank-robber ready eye/nose/mouth holes), Thinsulate gloves, heavy ski gloves, and long scarf. Now imagine a tall, rather beefy man with legs that were quite hairy really, in what was apparently a plaid skirt that stopped a bit above his knees, which were not knobby at all. I was immediately gripped by the fear that a stray gust of wind would answer that eternal question: "What is he wearing UNDER that thing?" It is that very reaction that a blogger I follow is counting on. Motorcop is typically good for a laugh, giggle, chortle, or guffaw. Reading his blog is often like sitting down with my son to watch "Stupidest Criminals" or "Worst Drivers" on television...in the best possible way! 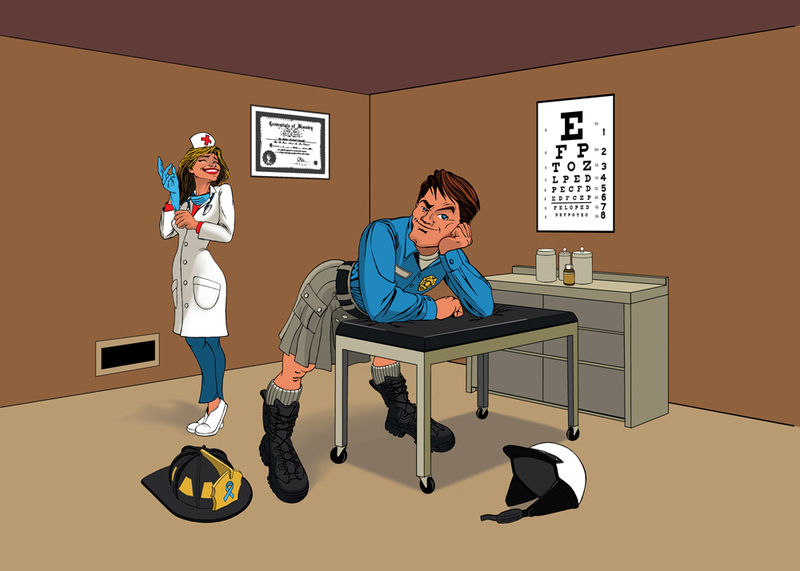 For the entire month of September, Motorcop and a friend of his, The Happy Medic will be wearing kilts. 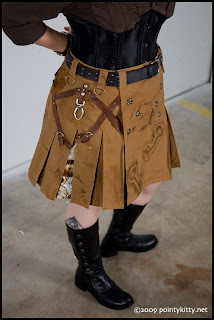 Really, really cool kilts. They, and others, are donning that most manly of male clothing in support of Kilted To Kick Cancer and to raise awareness of prostate cancer. They're hoping to encourage men over the age of 40 to overcome their natural shyness, take control of their destiny, and get checked. So pass the word, happy minions! If you know a man over 40, and you're desperate for a gift they'll never forget, head on over to Alt.Kilt to get an unbelievably AWESOME kilt, and include a gentle reminder about getting on down to their doc for a quick check. Better to blush for a moment than to find yourself mourning the loss of someone you love! There is still something that grabs my attention every time I see a man in a kilt. I think it's the impression that any man willing to wear one is a MANLY man...pretty much has to be what with the skirt thing and all! The best is when he's wearing a sporran to go with it! I almost posted a pic of Sean Connery (yum!) in a kilt with a sporran!